Join the discussion on our forums! 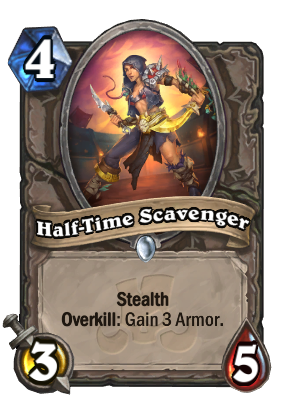 Come discuss Half-Time Scavenger over in our dedicated Half-Time Scavenger discussion topic. Stealth. Overkill: Gain 3 Armor. One player's trash is another's “Best In Slot”. In Innkeeper it comes up as a 0 cost card. I think this is one of the cards, which will bring Odd-Pala to his downfall. After it lost stealth it has a semi-taunt, because it heals you otherwise for 3 health (nearly) every turn. A good card that can give priest for example armor not to mention the divine spirit inner fire potential for an otk deck...or just divine spirit or divine shield inner fire it for multiple turns of armor gain. This card forces your opponent to trade or silence it asap...scary with keleseth. I realize it's one mana more, but I've never seen a priest run Stranglethorn Tiger. With that said, the card is still good. That looks like a pretty decent minion versus aggro decks.